Which Dog Potty Does a Famous Dog Star Use? A certain portable dog potty has received the paw print of approval from a famous dog star! 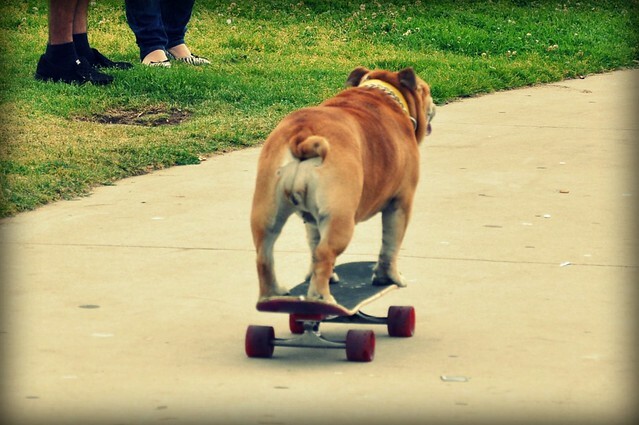 Tillman the Skateboarding Bulldog just loves his – in fact, he thinks it’s the best canine litter box he’s ever seen (at least, his owner thinks so)! This bulldog on wheels has been using the Porch Potty not just at home, but also when he’s on the road for shows and special events. The Porch Potty is a new portable dog potty, and Tillman had his with him at this year’s Rose Bowl Parade, where he was invited to ride a float and show everyone his skateboarding skills. If you saw the parade, you may have noticed that there was a skateboarding rink on the float, and in the middle of the rink was his Porch Potty. Why does Tillman and his owner love the Porch Potty so much? First of all, it’s lightweight and portable, so they can bring it with them anywhere. It can also hold real or synthetic grass, which dogs have a natural instinct to potty on. And probably the most important factor of all for dog owners is that it’s easy to clean! The automatic sprinkler system and drain makes maintenance a breeze. Who wouldn’t be impressed by the Porch Potty? Most canine litter boxes only have a catch pan or tray to collect and hold the urine. This means that you will have to clean up the mess! And regularly, too, or else it will start to smell. On the other hand, the Porch Potty features a complete, patented drainage and sprinkler system that is built in and does pretty much all of the cleaning up for you. Plus, the Porch Potty is made of plastic with UV protectant, so it won’t fade or yellow even after more than a decade. It also won’t mildew, rot, or absorb odors, bacteria, or moisture. That sure sounds like my kind of potty! The Porch Potty has all these features and more, all for one of the most competitive prices on the market today. You also get a bunch of freebies with each purchase. Tillman the Skateboarding Bulldog definitely has good taste!